I've finished hand coloring my screen printed currency and thought I'd share with you some of the thinking behind the designs. There are four different "denominations" in my currency, basically Earth, Air, Fire, and Water. On the front face of each denomination is a hand which emerges from a cloud and holds a symbol of the element. Each note also has a quote. The back face is the same for each denomination, just colored differently. The "Earth" quote is from Wendell Berry, who has been an advocate for localism and stewardship of the earth for over 50 years. Berry just gave a powerful speech as the 2012 Jefferson Lecturer at the National Endowment for the Humanities a couple of days ago. The words on the "Air" note are a paraphrase from a Ray Bradbury story called Something Wicked This Way Comes. The story is kind of a horror story, but it opens with an intriguing character who is a lightning rod salesman. The lightning rod salesman has an uncanny sense of the atmosphere and the weather, so I liked using his words here. The quote on the "Fire" note is from Albert Schweitzer. 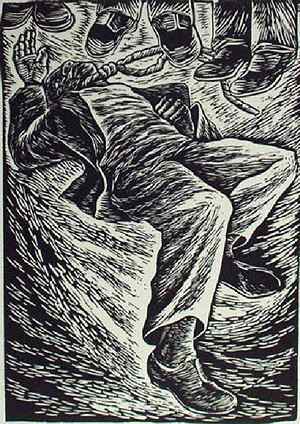 Schweitzer is not often mentioned any more, but I remember when I was a child my parents spoke of him with admiration. Schweitzer was a medical missionary and 1953 Nobel Prize winner who espoused reverence for life and worked in pursuit of a universal ethical philosophy that could transcend religions and cultures. The "Water" note quote is another from Wendell Berry, a lovely twist on the Golden Rule. This is a song that I learned and became very fond of in the early 1990s at a place called The Opening the Heart Workshop. Turns out the song was written by two Rabbi brothers named Nathan and Joseph Segal in the late 1960s. I like it for its evocation of community and interdependence. In this currency I wanted to honor and elevate those parts of the economy that are so often ignored by economists in their calculations about value and worth: the goods and services provided free of charge by nature as well as the cultural heritage given to us by our ancestors. We would have nothing if not for these gifts. And they are gifts. Nothing we have done has caused them or made them ours. There's one more bill in my system of notes. I called it "Jubilee," based on a few Old Testament Bible verses. Deuteronomy 15:1 talks about a Sabbath Year -- "At the end of every seven years you must cancel debts." And Leviticus Chapter 25 speaks about something called a Jubilee, which is the seventh of the Sabbath Years and is a time when all slaves are set free. I liked this concept. Sometimes debts need to be forgiven, so this is kind of an "I-don't-owe-you" note. Next I'll be bundling these bills into sets that contain four of each denomination plus one Jubilee note. This print is the second in a series that examines cliches we have about money that use the same metaphor for both wealth and poverty. Here we have sayings that seem to indicate that both wealthy people and poor folks sit around doing nothing, so I decided to add a few weed-like plants to the background color field. After printing the weeds in another lavender red tone, I added the words "lazy poor" using transfer drawing as shown here. I spent the day today at the beautiful new Zea Mays Printmaking Studio and helped get it dirty by screen printing the currency I designed last month. My experience with screen printing is very limited, so I had no idea how much I'd be able to accomplish in one day. I had prepared enough paper to do about 45 sheets of each of the four "denominations," and I brought all four screens with me. It turned out that in the 7 hours I had available I was able to print two denominations. Way faster than woodblock!! This is the "Earth" denomination. You can see that they're laid out to print six at a time. The back side is printed too. This is the "Water" denomination. Here are a few of the bills cut down to singles. 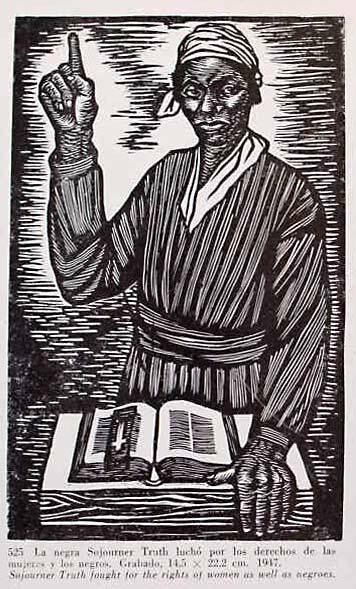 I'll be going back to the studio next week to print the other two denominations. Here's the print after four applications of color. Now I'll carve some more. 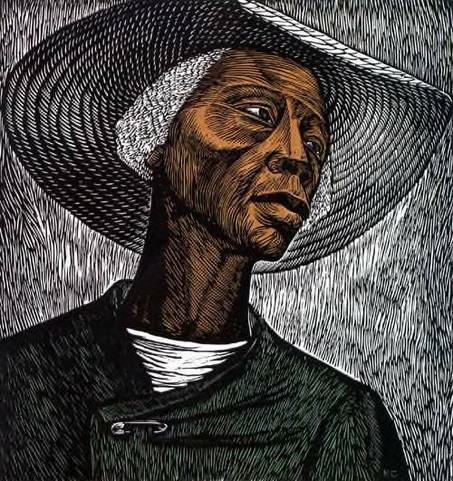 I just learned today that sculptor and printmaker Elizabeth Catlett passed away yesterday, April 2, 2012, two weeks before her 97th birthday. 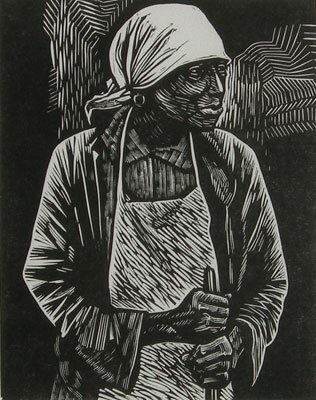 A granddaughter of slaves, Catlett was born in 1915 in Washington, D.C., and studied art at Howard University and University of Iowa. 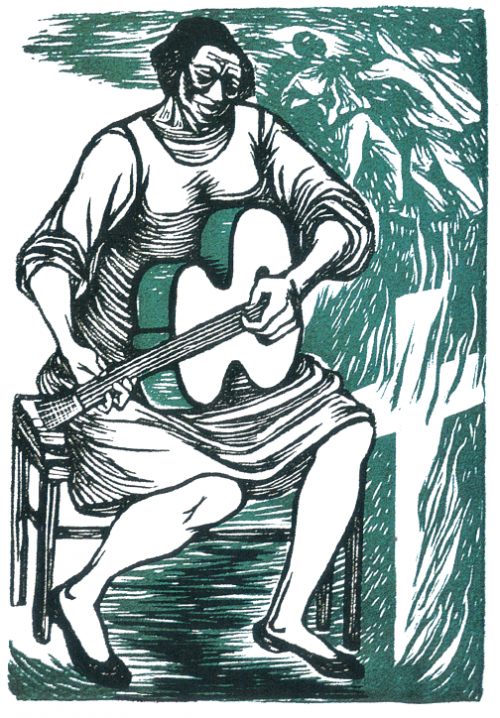 In 1947 she married a Mexican artist named Francisco Mora and became a Mexican citizen. 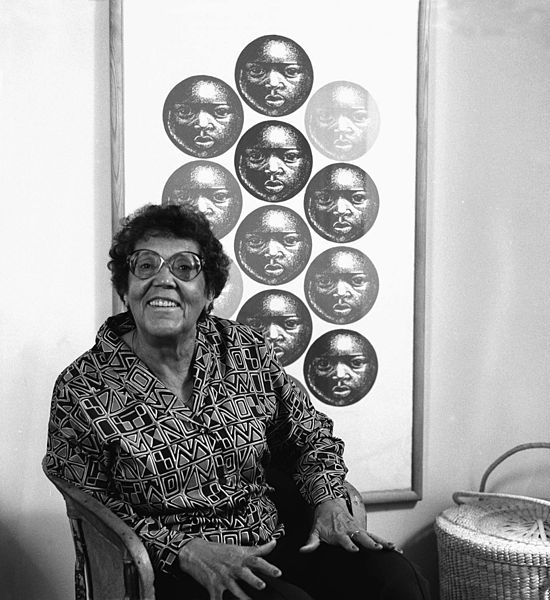 Over the span of her 70 year career, Catlett created strong politically charged work. 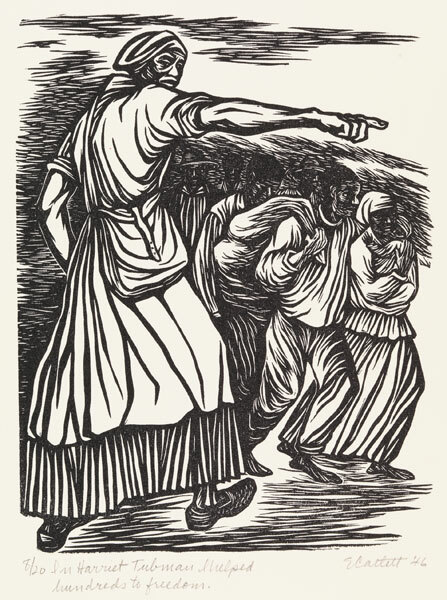 In Mexico she worked with a group of printmakers called The People's Graphic Arts Workshop who were dedicated to using their art to promote social change. Here are some of her powerful prints. Added 4/4/12 at 7:45 a.m. -- Here's an obituary with more information from the Washington Post.